Han & Leia are captured by Crimson Jack. 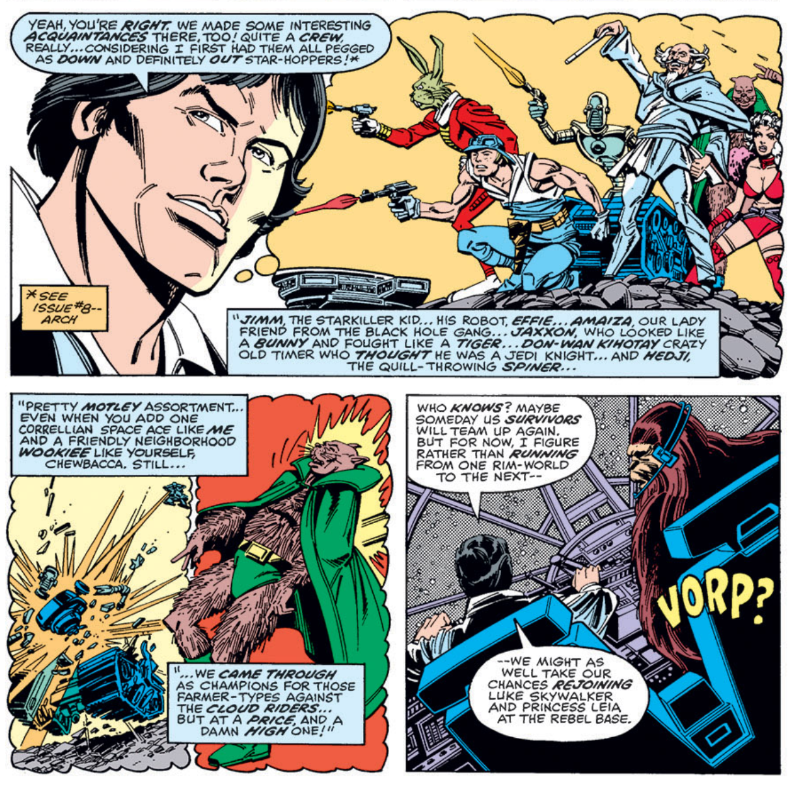 As Han and Chewbacca leave Aduba-3, planning on rejoining the Rebellion, they once again run afoul of the pirate Crimson Jack, prompting Han to reason that Crimson Jack must have put a tracer on the Falcon during their last encounter. With an idea in mind, he allows the ship to be captured peacefully. 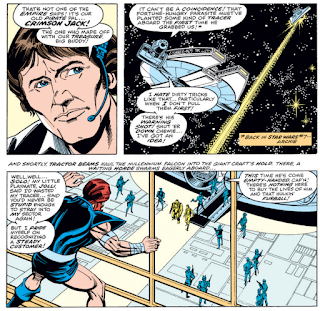 But when they come aboard, they're stunned to discover Jack has captured Princess Leia, who was heading to the Drexel system in pursuit of Luke, and intends to ransom her to the Empire. 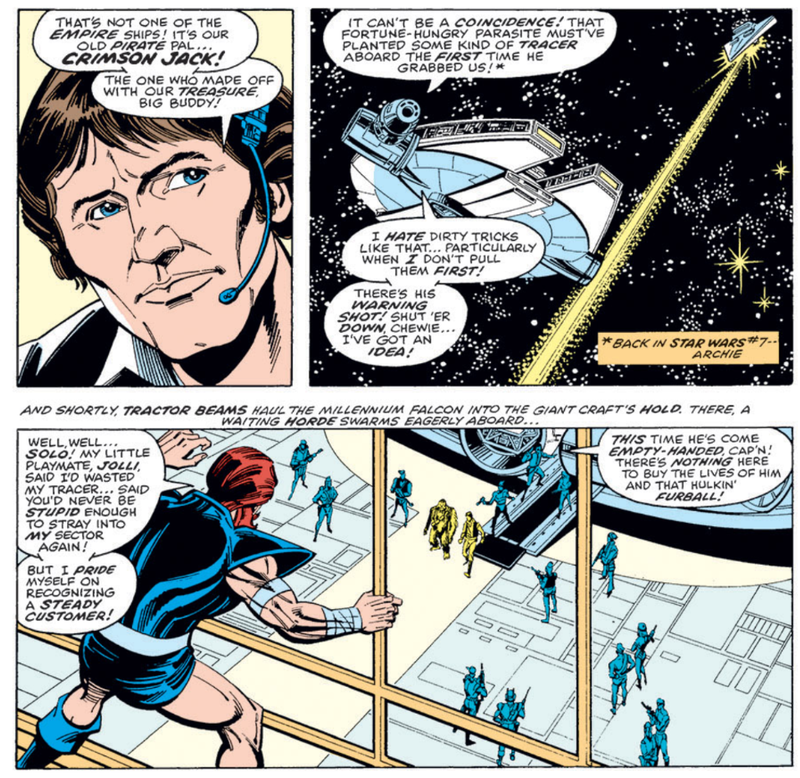 Shifting gears, Han convinces Jack that the Rebel treasury is located on Drexel, and that he can lead Jack's pirates through the defense grid in exchange for a fifty/fifty split of the loot. Leia, not seeing any better option for escape, plays along, and the pirates set off for Drexel. 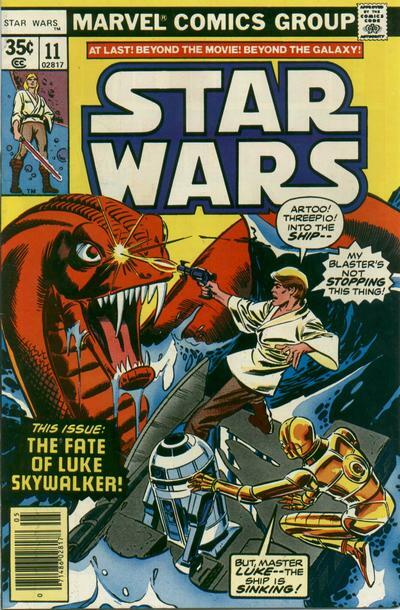 Meanwhile, on the planet, Luke and the droids have crashed into an ocean and are fighting off a massive sea serpent. With Artoo's help they use the ship's escape pod to launch themselves away from the sinking vessel just as the creature destroys. Surfacing, they spot a second serpent, as well as someone riding it, and realize the creatures are being controlled. New series writer Archie Goodwin and artist Carmine Infantino debut with this issue, and their run on the series, which will last essentially through issue #50 (though with some fill-ins sprinkled throughout, especially towards the end) is considered one of the series' definitive runs, if not its most definitive. Goodwin, when taking over the book, had just stepped down as Marvel's Editor-in-Chief, the last in a series of short-tenured E-i-Cs at the time, giving way to Jim Shooter, who would of course keep the job well into the 80s and leave an indelible mark on the company. Carmine Infantino, meanwhile, is a legend in the field. He helped usher in the Silver Age of comics by co-creating the updated Barry Allen version of the Flash in Showcase #4, penciled the subsequent Flash issue which introduced the idea of the DC multiverse, was the artist on the "New Look" era of Batman in the 60s and co-created the Barbara Gordon iteration of Batgirl, served as the editorial director and later publisher of DC Comics in the 70s, during which time he helped bring over Jack Kirby from Marvel, leading to Kirby's acclaimed "Fourth World" series of titles, and much, much more. 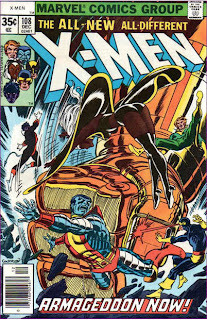 Infantino is inked by noted future X-Men inker Terry Austin, though Austin will stick around only through issue #15. Crimson Jack, the pirate who first appeared in issue #7, returns along with this companion Jolli, having captured Princess Leia between issues. In flashback, Hedji the Spiner is depicted as being brown, not purple. His death, which was nebulously depicted last issue, is also confirmed. Han insists to Chewie that despite his actions on Aduba-3, he's not going soft. When Han tells Jack he received the previous treasure which Jack stole from him for rescuing Princess Leia from the Empire, Jack notes that he's heard rumors of such a thing. Leia, in turn, points out that she should be used to Han muddying up rescues by now, a reference to his and Luke's ill-thought out rescue of Leia in the movie. Crimson Jack refers to Han as a star-rover, and offers to open a spice-keg (which, whether an intentional allusion to noted Star Wars illicit substance "spice" or not, must be different than actual spice, as it is not a liquid). The text of this issue, not just a "next issue" box, refers, to the main characters as Star-Warriors, a collective term I'm more than happy to adopt. 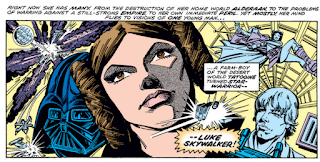 Early in the issue, Han provides a handy recap of the previous story to any first time readers, while Leia later does the same thing regarding her and Luke's portion of the story. 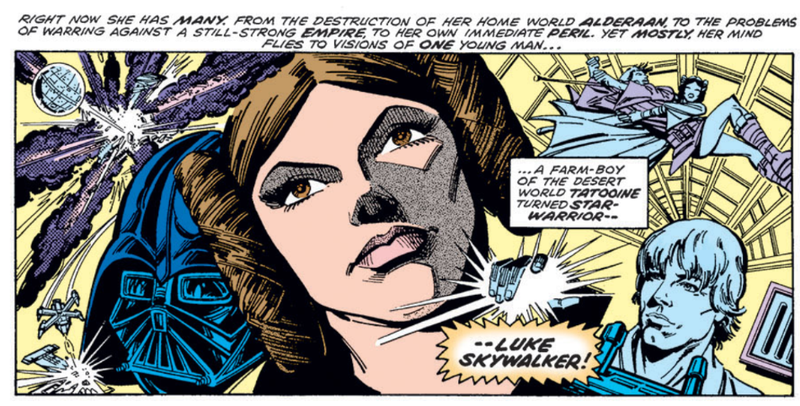 Another flashback to the events of the film in this issue, this time a one-panel montage of notable events from Leia's perspective. 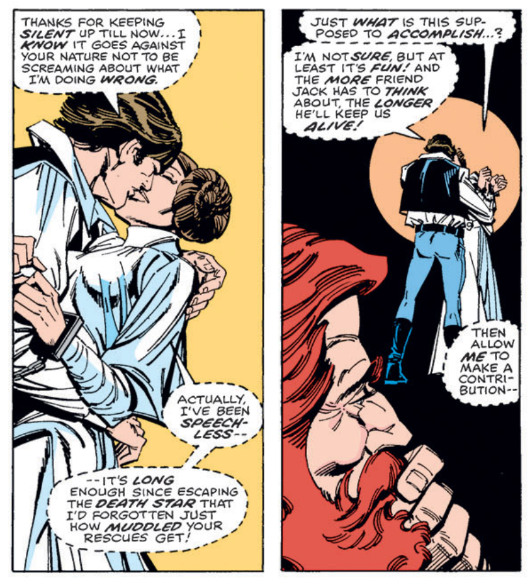 Showing off some of the banter that defines their relationship, Han refers to Leia as "your royalness" in this issue, and the pair kiss (albeit in an attempt to fool Crimson Jack) for the first time, well before their first on-screen kiss in Empire Strikes Back. With their first issue of the series, Goodwin and Infantino immediately improve things. Infantino's art, crisply inked by Terry Austin, is sharper and much more consistent than the work from the hodgepodge collection of pencilers, inkers and layout artists that collaborated on the series' previous four issues. 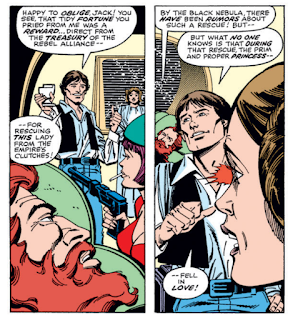 Meanwhile, Goodwin sets about immediately bringing the main characters back together, getting Han and Leia in the same room together for the first time since issue the film adaptation ended, and putting them both on the path to reuniting with Luke, all without outright abandoning the plots Roy Thomas had set in motion before his departure. He also shows a decent grasp on their characterization, having Han acknowledge his somewhat atypical behavior in the previous story and writing some Han/Leia banter that would feel right at home in the films. Crimson Jack, far moreso than Jaxxon or any of the other Star-Hoppers is also a smart character to bring back, as he fits much more naturally the tone of the film (visually, Crimson Jack is still perhaps a bit too outlandish and overtly comic book-y, but in function he's more or less of a piece with the numerous other pirate characters that will come to populate the Expanded Universe). There's definitely some filler here with the era-mandated pages recapping the previous story and some of the events of the movie (again), and, overall, not a lot of happens in terms of direct action (really, the only action scene is Luke and the droids escaping the sea serpent at the very end), but otherwise, this is a strong start for the new creative team, one which fits much more easily into the aesthetic of the films without ripping up the groundwork laid by Thomas and Chaykin in their original story. Great recap! Looking forward to reading future reviews. Quite the perfect hexagonal face you got there Leia! That cover’s familiar. 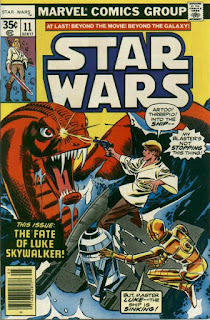 I’m pretty sure this was the first issue I bought after the adaptation — most likely because further adventures with Luke and the droids were really what I’d been looking for in more Star Wars, despite having bought two of the prose novels starring Han and Chewie; then again, I probably would’ve flipped through the issue before purchase and noticed there wasn’t much Luke, so maybe someone got it for me. @Erik: Great recap! Looking forward to reading future reviews. Thanks! Glad you're enjoying the series. @Frenchie: Quite the perfect hexagonal face you got there Leia! Right? Reading this material for the first time, I'm surprised at how sharp and angular Infantino's work is. The sharpness could be attributed to being inked by Terry Austin, but Infantino is an artist with whose work I associate with smooth, soft, long lines. His Flash, for example, is all roundness and fluidity, whereas a lot of the figures here are so sharp ans angular they could almost be pieced together from geometric shapes. His style here is right in line with his Spider-Woman from the same period, his ‘80s return to Flash and Dial ‘H’ for Hero in Adventure Comics, etc. While I found the angularity intriguing on Spider-Woman, where it was sharp like this and there were lots of spotted blacks, I was less enamored of it when employed more sketchily; overall I disliked Infantino and hated Don Heck as a kid through the ‘70s and ‘80s, only to discover later why so many pros listed them among their favorite artists when digging into their ‘60s stuff. Anecdotally I think that Infantino was legitimately refining his style whereas Heck was more in a late-career phone-in-it phase, but regardless, yeah, Infantino's look really changed from the earlier, more fluid Batman and Flash stuff, and probably not entirely because someone like Joe Giella would round off his rough edges where Austin or other latter-day inkers were truer to his pencils. I came thisclose to making a TIE fighter remark myself. Okay, this such a vast improvement over Thomas and Chaykin that it's like night and day. This doesn't feel like STAR WARS or the Expanded Universe as we know them today, but, if it makes sense, this feels like what a continuation of the original movie should have been, where Thomas's stuff just didn't fit the tone that had been set by the film. Also, Goodwin's scripting is so much better than Thomas's I mentioned before that I really don't like Thomas's writing all that much because of his non-stop, copious prose. It's like he wanted to be a novelist but settled for comics. Whether it's true or not, nearly any Thomas script feels to me like it's more than 50% narration. Goodwin, on the other hand, lets dialogue tell his story (along with the pictures, of course) and only uses captions for recaps and to facilitate scene transitions and such. And best of all, his captains are straightforward and simple, unlike Thomas's ridiculously over-the-top flowery prose. Goodwin's style is much more appropriate to a comic book. And the Infantino artwork! I love it! This is the main reason I've wanted to read this stuff for years, based on what little I'd seen of it. 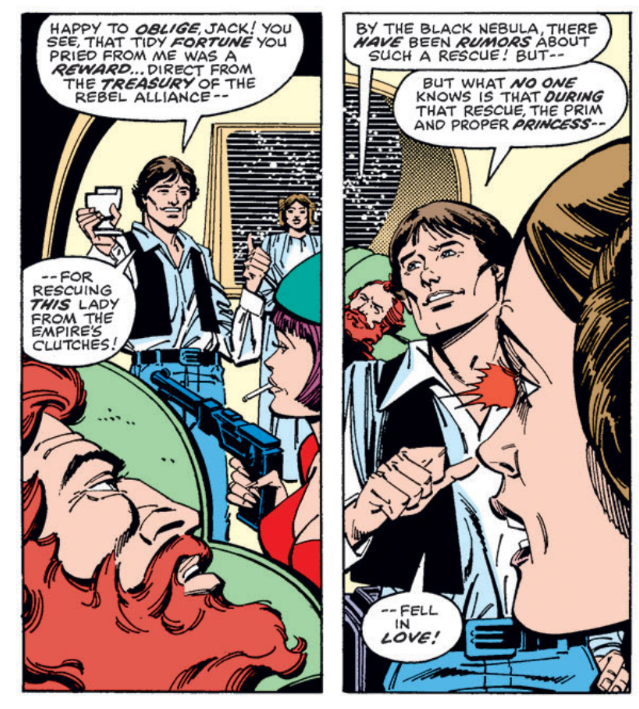 Chaykin's work, except when inked by Tom Palmer, looked rushed and ugly most of the time, and so often his characters (especially Chewie) were horribly off-model. Infantino fixes that by stylizing everyone. You can tell who they're supposed to be, but he's not attempting likenesses for the most part and it works much better. 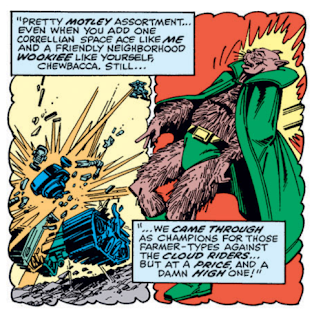 Even his off-model Chewie looks great to me. I love his square-jawed Han and his angular Leia, too. Plus his cartooning is terrific. The shot of Leia kneeing Han is great. I love this artwork and I'm excited to enjoy another twenty-some issues of it, though I hope his upcoming inkers are as compatible with this style as Terry Austin. Anyway, this issue alone is superior to all of the previous ten put together. Can't wait to read more. You might enjoy his run on the first Spider-Woman series from this very same time. 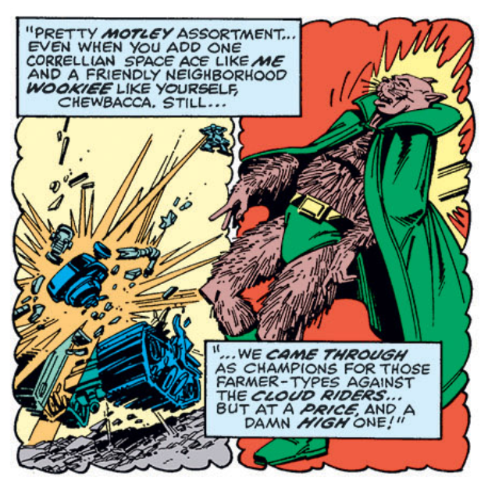 He and inker/embellisher Tony DeZuniga make a surprisingly good team.